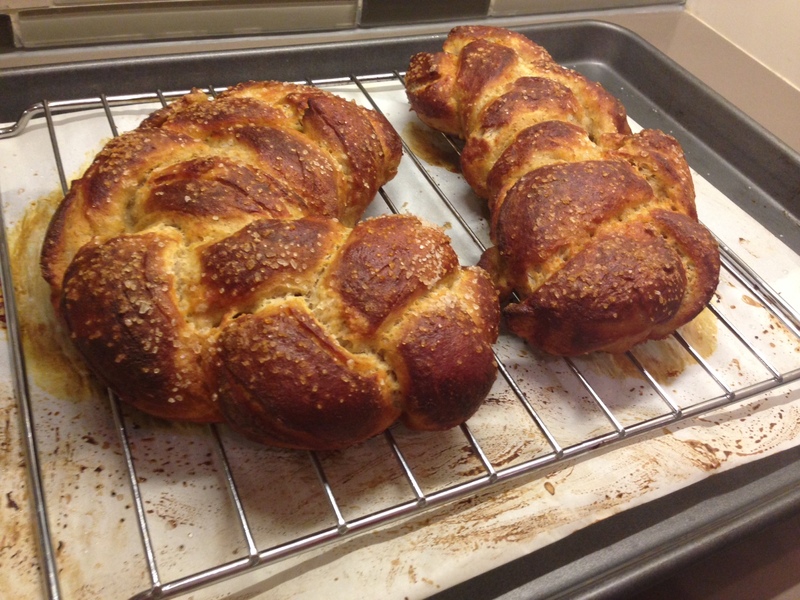 I consider my soft pretzels to be one of my signature dishes. They’re salty, savory, and have the most delicious crust because they get boiled in baking soda water before going in the oven. 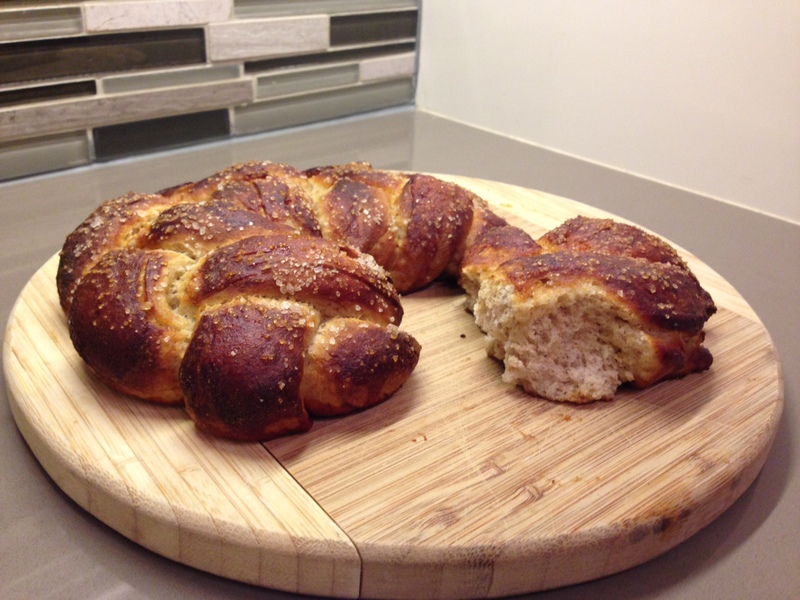 To prepare for Hanukkah, I decided to do a batch of pretzels but instead of the standard shapes, I created two braids with the dough. I also made them vegan, and used a bit of rice flour to bring down the carb and calorie counts. 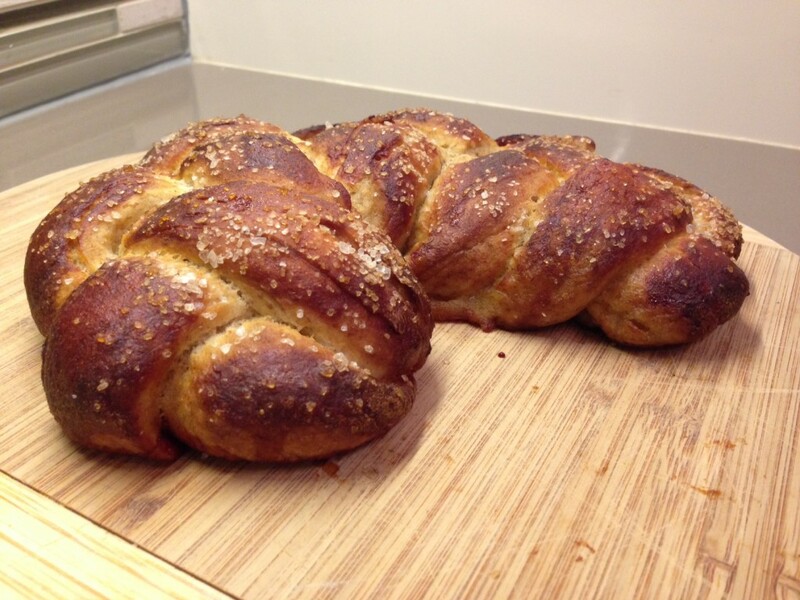 With my regular pretzel recipe I use butter in the dough, as well as an egg wash right before baking. The butter was easy to replace with coconut oil, but the egg wash was a little trickier. Edgy tip! 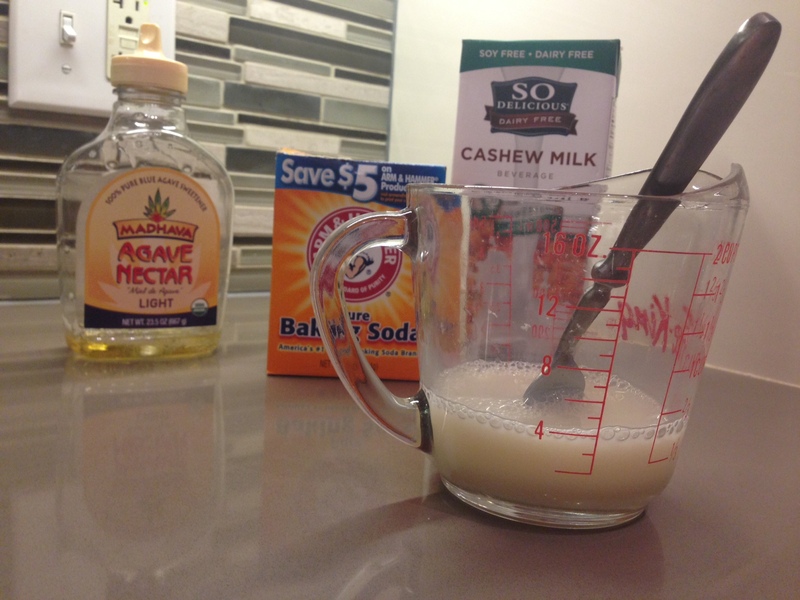 For a vegan egg wash, use a mixture of cashew milk, agave, and baking soda. 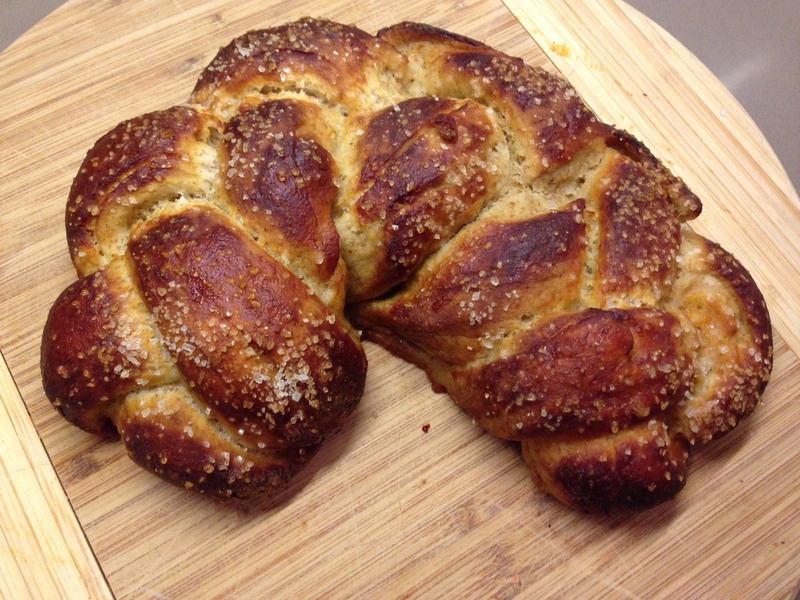 The natural coloring from the agave, and the alkaline in the baking soda will give you a great looking bread without needing to use any eggs. 1. Measure out warm water, then add sugar and salt. Stir, then add yeast. Let sit until frothy. 2. 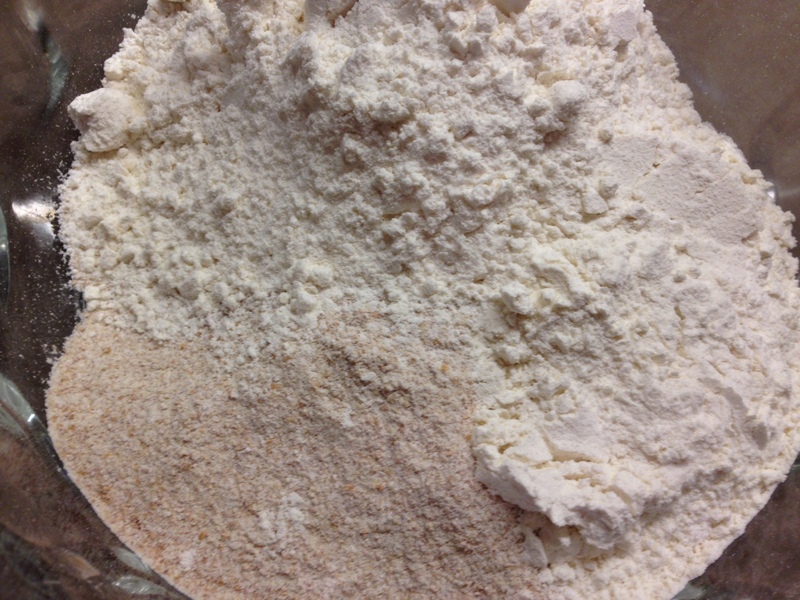 In a different bowl, combine flours. 3. 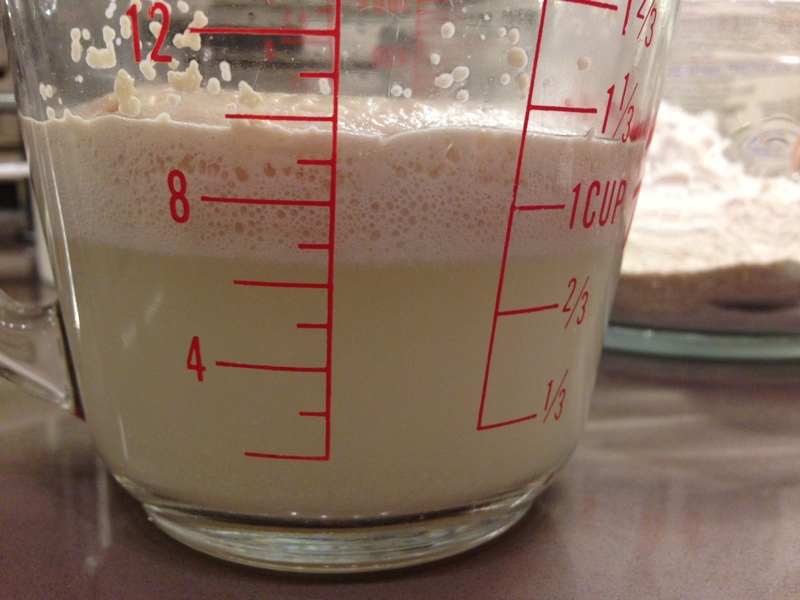 Melt coconut oil in a mug, then stir into water and yeast mixture. 4. Pour liquid ingredients into dry. Stir with a fork, then with your hands. Knead for about 5 minutes. 5. Lightly coat the bottom of a glass bowl with olive oil. 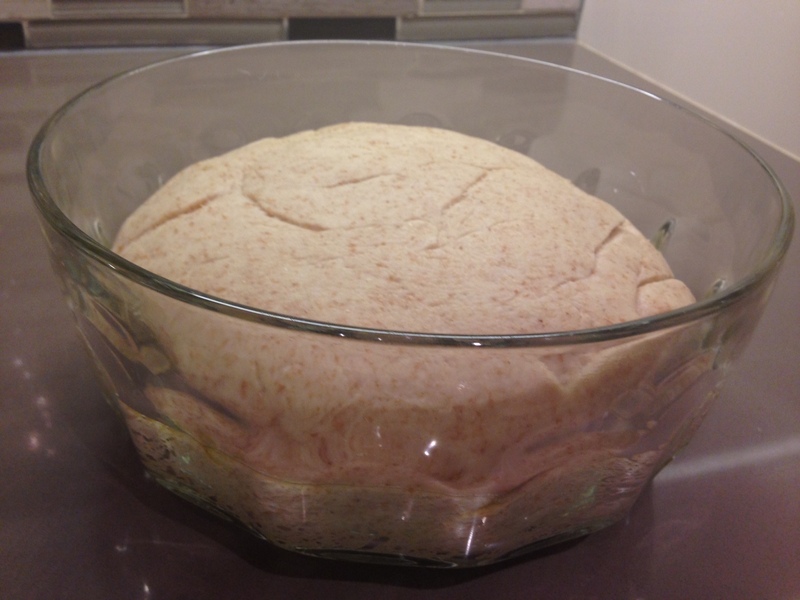 Place dough in bowl, then flip so that both sides are coated in oil. 6. Cover with saran wrap and let rise in a warm place for about 40 minutes. 7. Punch down dough, then dive into 6 equal pieces. 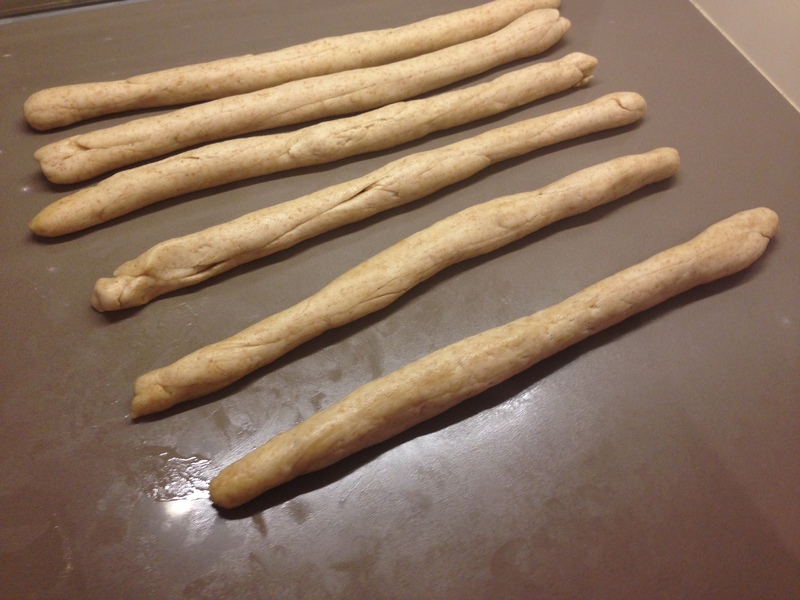 Roll each piece into a 12 inch long strip. 8. 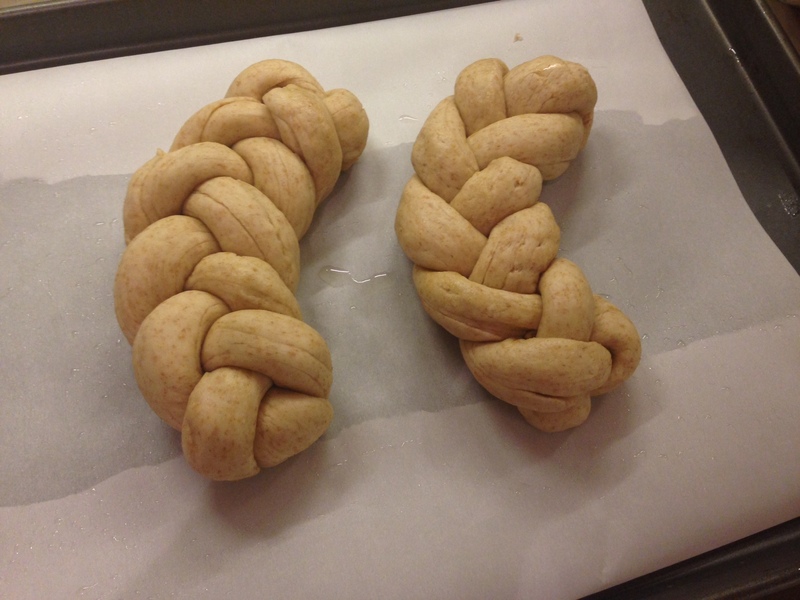 Form two braids from the strips, and tuck pinched ends underneath the dough. 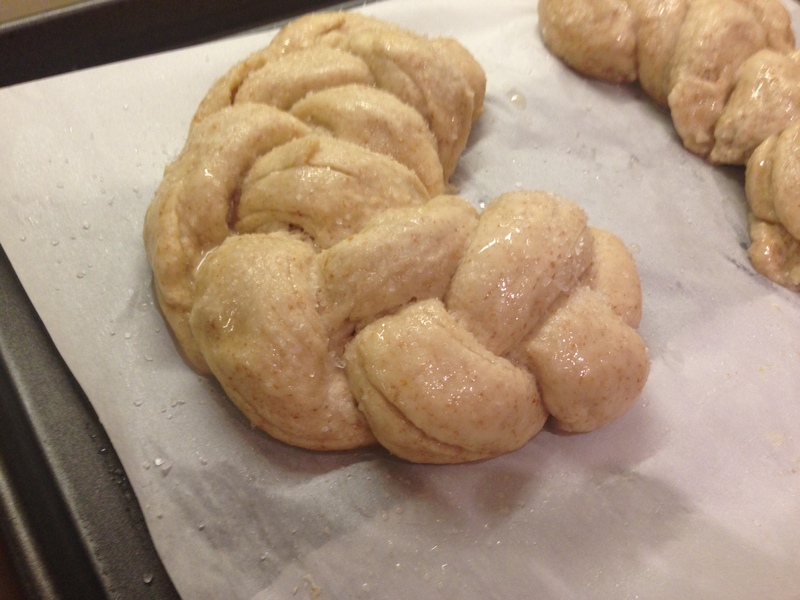 Transfer braids to a lightly oiled, parchment paper covered baking sheet and let rise in a warm place for another 20 minutes. Then, let sit in the refrigerator uncovered for another 20 minutes. 9. Heat a pot full of warm water and about 1/3 c baking soda. 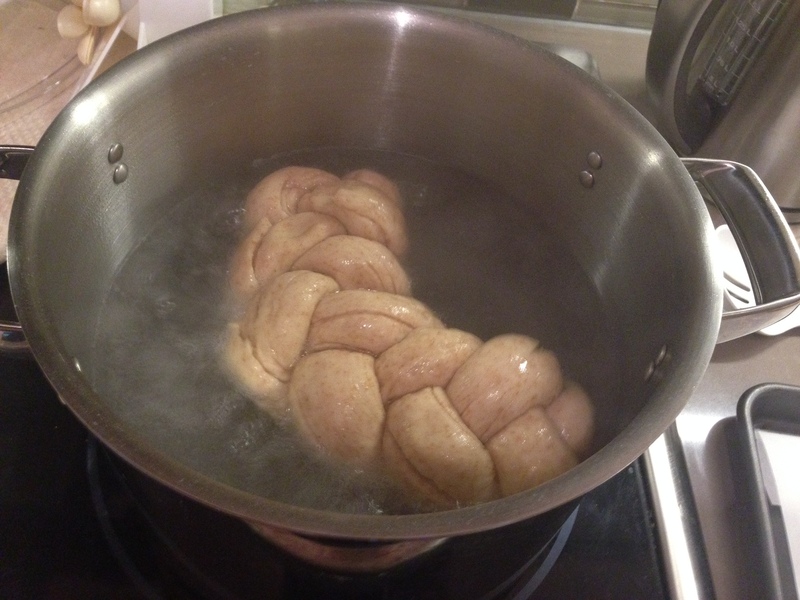 Once boiling, carefully place one of your pretzel braids into the water. 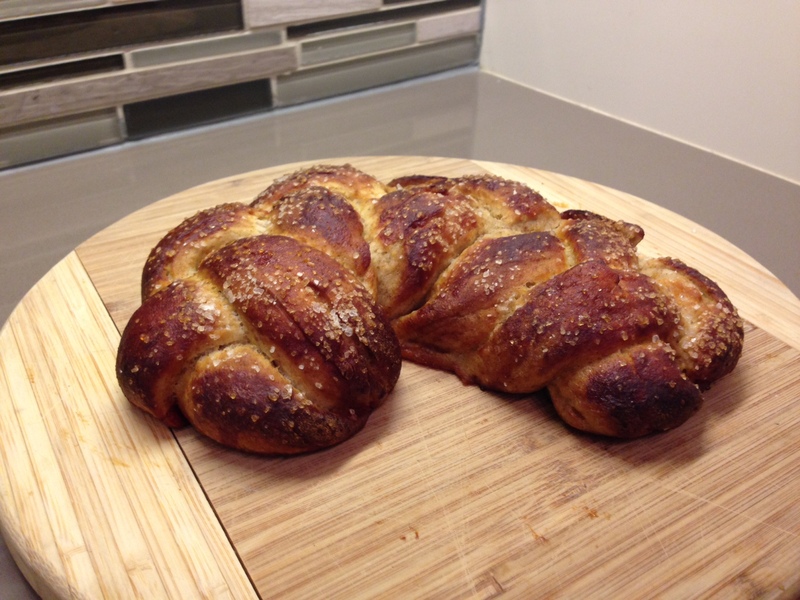 Spoon the boiling water over the pretzel as it cooks for about 30 seconds. 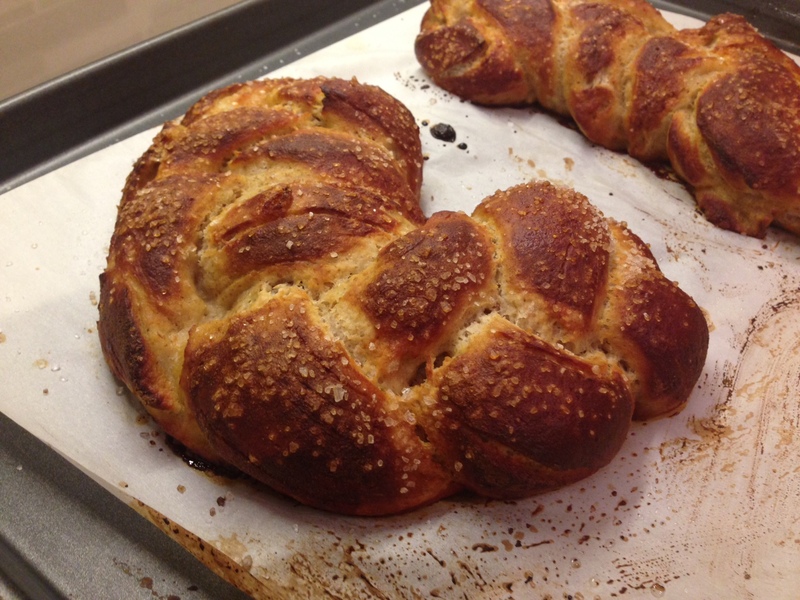 Remove pretzel challah using a large spoon and a small cutting board. 10. 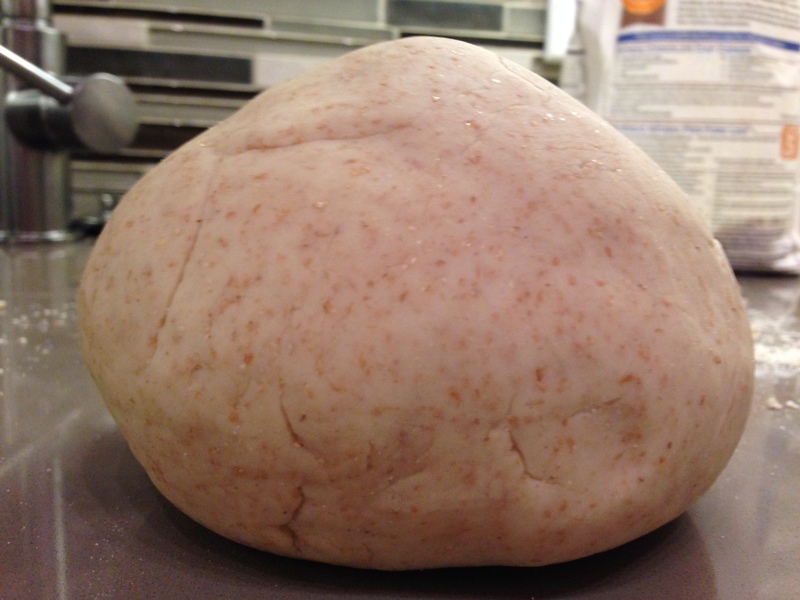 Lightly brush dough with vegan “egg” wash, then sprinkle with sea salt. 12. Bake in an oven preheated to 440 degrees fahrenheit for 14 to 16 minutes or until nicely browned. 13. Transfer to a cooling rack after no more than 5 minutes, and let cool for at least half an hour before eating. Made these tonight and they’re perfect, despite multiple “following directions” failures on my part. Thank you for the recipe! So glad you enjoyed! Keep up the baking. They look wonderful! I love to bake and these look so festive and delicious. Thank you for sharing. It is great that a vegan does not have to adapt the recipe. You’re very welcome. 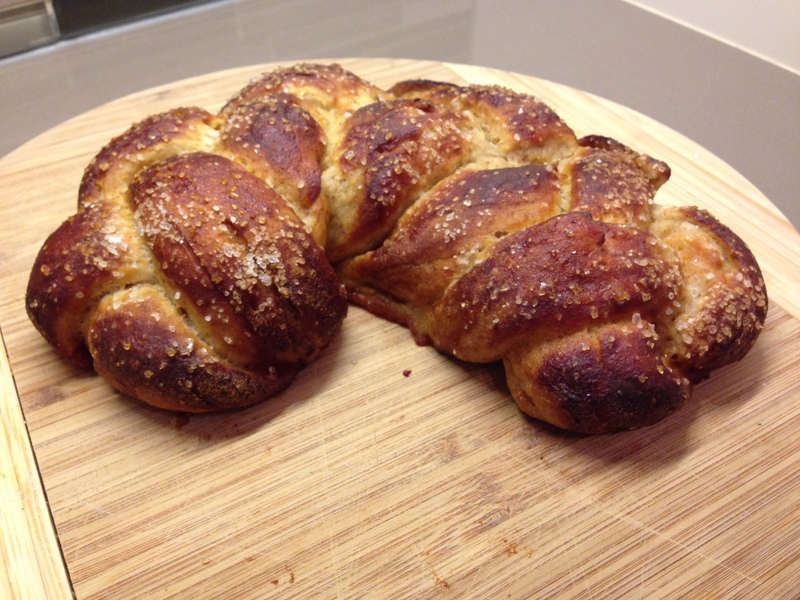 Please let me know after you try the challah, I’d love to hear how yours comes out! I came across your blog as I was looking for an egg and dairy-free alternative to egg wash, with good browning capabilities. I noticed that in your instructions (edgy tip section), you made reference to cashew milk however under the ingredients section, coconut milk was listed. Could I please ask which should be used, or if they are interchangeable? Ah good catch. It’s cashew milk. Thanks, I updated the recipe.